PAMP gold bars are the cream of the crop when it comes to gold bar bullion, and these bars are preferred by investors all over the world. These are manufactured in Switzerland by PAMP, a world renowned bullion refinery which offers the finest quality products possible. Each one is guaranteed twenty four karat gold, and are marked for weight, quality, and finesse. PAMP Suisse gold bullion is Swiss precious metal at the very finest, which is why it is so sought after by investors. If you want to invest in gold bullion then the PAMP name and Swiss origin of these bars can give you a solid and top quality investment. It’s worth noting that PAMP gold bars are manufactured by two different methods of casting and minting. Cast bars come in a variety of sizes ranging from 1 tael (Asian unit of measure) to 400 oz based on preferences of regional consumers whether these are Chinese industrial manufacturers, European financial institutions or large scale investors in North America. Minting method lends ingots with a more refined sophisticated look available in smaller sizes from 1 g to 1 kg to tailor to individual investors’ smaller budgets. PAMP refiners painstakingly follow the manufacturing protocol from rolling out cast metal pieces to gauging, annealing, weighing, polishing and striking designs to ensure the best possible end result. One optional factor with PAMP gold bars is the design etched on the back of the bar. There are three choices, A Fortuna, a Rose gold, and a Liberty ingot. Credit Suisse gold bullion is also known around the world as being one of the the finest precious metal bar that is manufactured and refined anywhere. If you are going to invest in physical precious metal, you want to know you are getting the correct weight and quality, and with Credit Suisse and PAMP gold bars there is never any question in this area. Each bar is stamped with the weight and quality, so there is never any guesswork. One of the most unique factors about PAMP bars is the serial number. PAMP offers Good Delivery status, and every bar produced can be tracked and traced from manufacturing to the present. 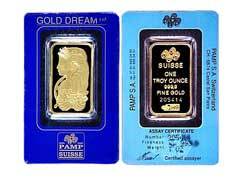 This eliminates the risk of any fraud or theft of the gold weight, so you now that you are getting a PAMP or Credit Suisse gold bar that is exactly what it appears to be. When you invest in PAMP gold bars there are never any surprises, and you get the high quality gold investment that you are looking for. There is a good reason why the Swiss are known as the finest gold makers.